There lies a sleeping giant. They were once at the cutting edge of British sculpture. Thirty years on, how do Richard Deacon and Bill Woodrow measure up in two rare retrospectives? The Fates have got themselves involved in our understanding of British art again, arranging for Richard Deacon to have a show at Tate Britain at the same time as Bill Woodrow has a show at the Royal Academy. Yes, the overlap of the two shows lasts little more than a week, but seeing these two former giants of British sculpture displaying their wares simultaneously remains a rare opportunity to compare, contrast, evaluate and decide. When I write “former giants”, I do not mean it as a slight. Both are significant sculptors; both can honestly be said to have changed the course of British art. But that was 30 years ago. In terms of their contemporary pertinence, the harsh truth is that both have slipped down the back of the sofa. So jump aboard my Tardis, reader, set the dial for 1984, and travel back with me to their finest moment. We’ll arrive at the last years of the Henry Moore era, awful art days when every piazza in front of every new office block seemed to have one of Moore’s lumpy bronze turds dumped in it. British sculpture had grown corporate and stodgy; portentous and grandiloquent; bovine and bronze. Then, just as the tedium was becoming unbearable, who should ride onto the front line of British art and save us with their wit and their colour, their nimbleness and their invention, but Deacon, Woodrow, Cragg and Kapoor — the four Messkateers. Where the Mooreists made art inspired by things you might find in a Yorkshire rock formation, the Messkateers were inspired by things you might find in a skip. A typical Henry Moore looked as if it revealed the hidden essence of a natural shape; a typical Richard Deacon looked like it was made by someone who had spent his youth playing with a Meccano set. Where Moore carved, smoothed and moulded, Deacon and Woodrow assembled, drilled and riveted. Their effort prompted many changes in British art, the most important of which was to turn sculpture away from the landscape and towards the city. Thus they paved the way for Brit Art. That was then. What about now? 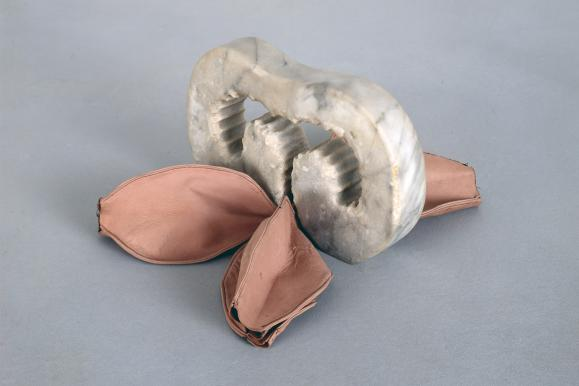 The Richard Deacon retrospective is long overdue, but, alas, is not the show it might have been. One problem is the scale of the galleries to which it has been sent. The basement rooms at Tate Britain are functional but characterless: they lack the height and grandeur that sculpture generally prefers. By concentrating on his bigger works, the exhibition remains low as well in the number of pieces it actually includes. While the catalogue describes a dizzy number of approaches, the show itself contains only a few of them, and errs on the side of samey. None of which is to say that Deacon himself is entirely faultless. He isn’t. When he started out, his art was so buoyant and witty. A room devoted to the series of small works from the mid-1980s he called Art for Other People shows him off at his best. Small enough to fit on top of a school desk, these gorgeous little sculptures feature such inventive combinations of shapes and materials. All are strongly abstract. None reminds you of anything else. It’s the juxtapositions that count: lino with marble; suede with brass; leather with stone. Here, you feel, is a sensibility that finds sculptural inspiration in sights the rest of us walk past, and spots beauty in materials the rest of us discard. All this is also in evidence at the start of the show, in the three big pieces from the late 1970s that kick us off. One is made of wood; another of glass and polyester; the third from galvanised steel. All three achieve a shape that is impossible to describe accurately. The galvanised steel is like a giant dunce’s hat with the ends cut off. The wooden piece is a kind of cubey-triangle, with something of the workbench about it. The glass and polyester looks as if it might eventually form a sphere when combined with all the missing pieces in the puzzle. In all these early sculptures, the hoped-for minimalism seems roughed-up and cut-price. Whereas Carl Andre’s pristine steel slabs look as if they have been bought from an industrial wholesaler, Deacon, you feel, scavenged for his metals at the council dump. If I had to find an art-historical term for the fine sculpture he was making in this period, I think I’d call it dirty minimalism. As long as his work maintains an emotional link with the scrapyard, all is well in Deacon’s art. It begins to go wrong when the sculptures start losing their roughshod quality and take on a perfectly riveted smoothness. Deacon, you sense, has moved from maker to designer: scale has lost contact with effort. 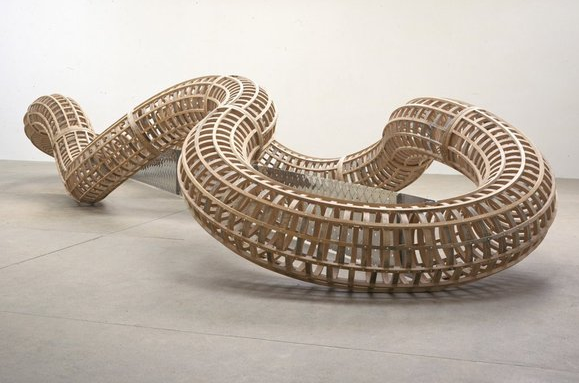 In particular, the huge, sprawling sculptures made of laminated timbers, in which the ribbons of wood draw snake shapes in space, become repetitive and uninteresting. Perhaps because of the lowness of the galleries, the final half of the show is dominated by horizontal art with a ground-hugging presence. 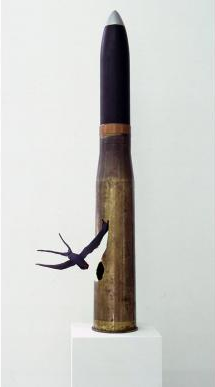 The excitement provided earlier by strikingly vertical pieces such as Tall Tree in the Ear, from 1984, made of galvanised steel interlocking outrageously with blue canvas, seeps out of the display. It may be an illusion, but for me the moods here begin to resemble the reclining, corporate, piazza moods of those dull Henry Moores they once overthrew. So that’s Richard Deacon: an exciting sculptor made dull by circumstances. Over at the Royal Academy, Bill Woodrow, of exactly the same generation, has also been given a retrospective, and remains a messier and more energetic presence.The first half of the show is conspicuously impressive. Like Deacon, Woodrow studied at Saint Martin’s School of Art in the 1970s and went on to source his materials in the skips of south London. But where Deacon was always a purist, interested primarily in textures and shapes, Woodrow was also a cheeky storyteller who used unglamorous materials to create witty sculptural narratives. In his signature works from the 1980s, he would cut up various bits of domestic furniture — a washing machine, a filing cabinet — and twist the unravelled metals into unlikely new shapes: a lizard, a stag beetle, a monkey. It was the approach pioneered by Picasso when he turned a bicycle seat and some handlebars into the head of a bull. But where Picasso was merely being impish and brilliant, Woodrow’s English variation on hey-presto art had something scruffy and socialist about it: as if he were making a point about ecological despoilment and the textures of poverty. The huge room filled here with examples is as exciting a room of British sculpture as I have seen in a long while. Unfortunately, the second half of Woodrow’s career saw the delicate meanings implicit in his early work made much too explicit in the effortful allegorical bronzes that followed. It all gets preachy and clunky. But that’s the second half of the show. The first half remains sensationally good. And you only have a week left to see it.